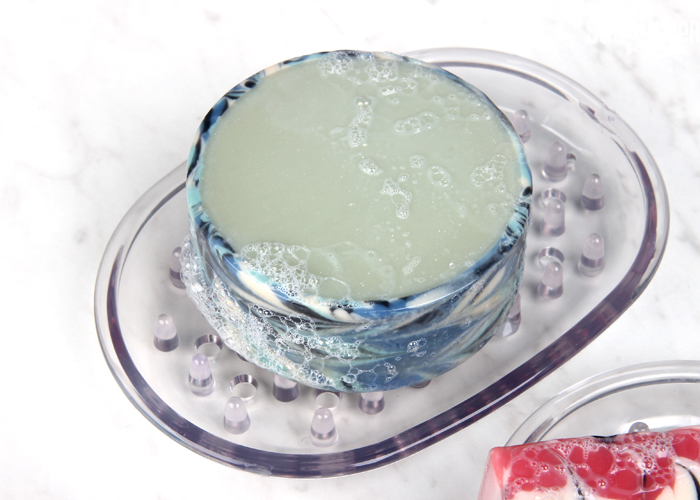 While cold process soap has many skin benefits, one downside is that cold process soap does not last as long in the shower as soap made from surfactants and detergents. When I give cold process soap to somebody who hasn’t used it before, I make sure to give them tips to prevent this. My number one tip is to make sure the soap sits in a soap dish, or shower rack. If the soap sits in water for too long, it will become mushy and soft very quickly. If you’d like more information on extending the life of your bars in the shower, check out my tips below. In general, firmer bars of soap last longer in the shower. 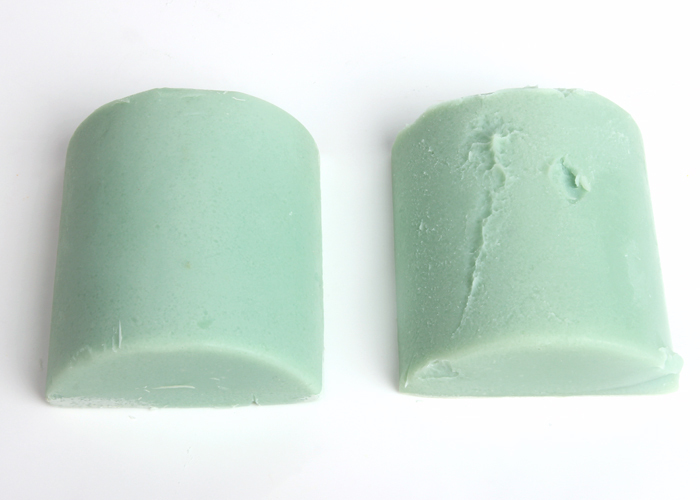 Using more hard oils helps create a firmer bar of soap. Hard oils refer to oils that are solid at room temperature such as palm oil, coconut oil, beeswax and palm kernel flakes. In general, soap with about 60% hard oils would be considered a firm bar of soap. That looks something like 30% coconut oil, 30% palm oil, 30% olive oil and 10% “something extra.” If your soap contains large percentage of soft oils, allowing it to cure for longer can help it last longer in the shower. For example, soap made with 100% olive oil (known as Castile soap) benefits from curing for six months to a full year. Stearic acid is a great addition to soap recipes if you’d like to create an extra firm bar of soap. It’s usually used as a thickening agent in lotion. It’s a vegetable derived waxy substance that can be used at a 0.5% of your oils in cold process soap. That sounds like a very small amount, but a little goes a long way when it comes to stearic acid! Keep in mind if you use stearic acid in your recipe, it will trace faster and needs a hotter soaping temperature (at least 160 ° F) to make sure it stays melted. Sodium lactate is the liquid salt of lactic acid. It’s generally added to cooled lye water at a rate of 1 teaspoon per pound of oils. 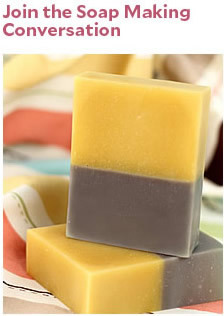 It does wonders for hardening up your bar, and really helps extend the life in the shower. I use it in just about every one of my batches! Learn more about sodium lactate here. If you don’t have sodium lactate on hand, you can also add table salt to your lye solution. In the Palm Free Vertical Twist recipe, we used about 1 tsp. of table salt per pound of oils in the recipe…just like using sodium lactate! Sodium lactate or table salt is especially great when the recipe tends to be a little softer (like a palm free recipe). Sodium lactate creates a bar that is firmer, can be unmolded faster, and also lasts longer in the shower. Soap on the left contains sodium lactate, while soap on the right does not. I received this beautiful bar from Tabitha in the Fall 2016 Soap Swap. I loved that Tabitha included a dish along with her soap. So clever! Making cold process soap takes patience. It needs time to sit in the mold to harden, which usually takes at least 2-3 days. Once unmolded and cut, the bars need to cure for about 4-6 weeks. 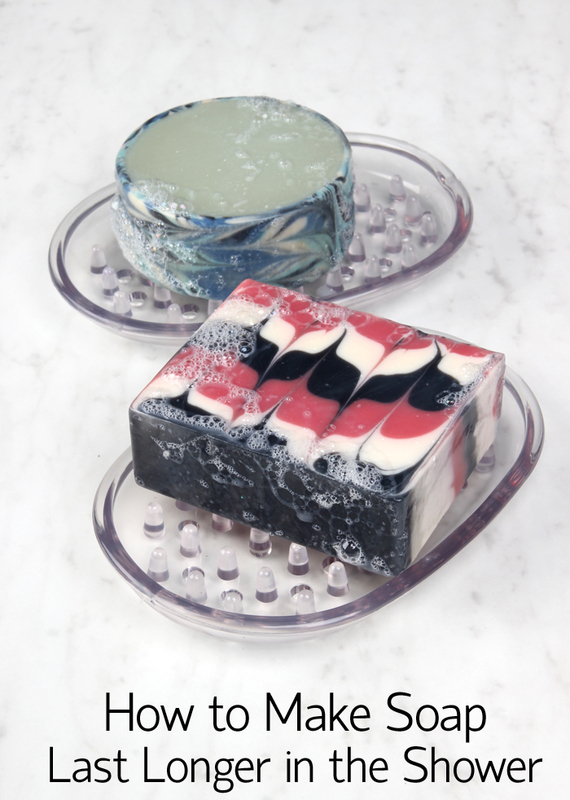 During this time, excess water in the soap evaporates, which creates a firmer and longer lasting bar. The longer the bar cures, the better. This is especially true for soap made with mostly (or all) olive oil, also known as Castile soap. 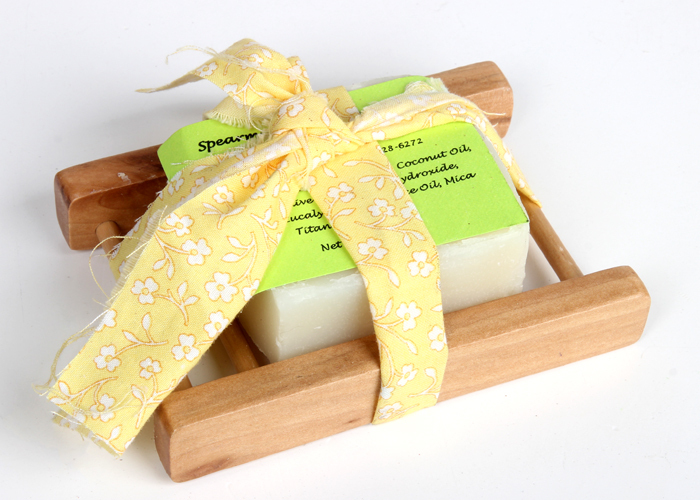 Castile soap benefits from a longer curing time of abut six months to a full year. The longer Castile soap cures, the less “slimy” the lather feels. For “normal” cold process recipes, a cure time of 4-6 weeks does the trick. If you water discount your recipe, the soap may not need to cure quite as long. 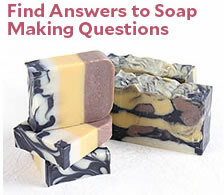 If you’d like to learn more about water discounting your soap, click here.